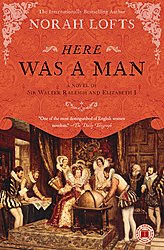 "In one of her earliest works, beloved author Norah Lofts brings us her riveting and romantic account of Sir Walter Raleigh and the court of Elizabeth I. Raleigh knew from the time he was a boy that his life would be exceptional. He dreams of someday exploring the New World he's heard about in snippets of sailors' stories on the docks of the fishing villages where he was raised; and his good fortune leads him to rise in the court of Elizabeth I, becoming a most trusted friend and advisor to the power players of the day. Raleigh's wit, ambition, and adventurous spirit endear him to all, including the queen herself, but Elizabeth's favor proves as much hindrance as help, as Raleigh still has but one goal in mind -- to take to the seas and secure his place as one of the great explorers of the age. The queen will not allow her young knight to be taken from her side, repeatedly refusing his requests for expeditions, until she at last reluctantly grants him permission to conquer in her name. Meanwhile, between journeys, his passion is stirred, not by the queen but by her lady-in-waiting Lisbeth. His loyalties are split between the boundless opportunities the queen can bestow and the pull of his own heart. With cameo appearances by Shakespeare, Marlowe, Sydney, and other luminaries of the day, Lofts once again paints a colorful, nuanced, and moving portrait of the Elizabethan Age. Here Was a Man is another timeless classic from the legendary Norah Lofts." "In the trademark style of Norah Lofts, the beloved bestselling historical novelist, it is the ones usually behind the scenes who take center stage to tell the story. In The Lute Player, Blondel, the musician whose life was constantly linked to that of the King, steps forward to tell this tale of romance, war and betrayal. One of the most legendary figures in medieval history, Richard the Lionhearted led his knights onto the Saracen battlefields, inspired by a vision of the Holy Land. In The Lute Player, Lofts introduces readers to the Soldier-King as he launches the Third Crusade. During the years of fighting and intrigue, King Richard's life was intertwined with two strong women who loved him: Berengaria, Princess of Navarre, and his mother, Eleanor of Aquitaine. While his union with Berengaria was ill-fated, his mother loved her son with a frantic, possessive pride. Along with Blondel, Berengaria and her hunchbacked sister help to tell the story of Richard's life, as Lofts paints a complex and human portrait of a legendary king." "1915. The dawn of the hydroelectric power era in Niagara Falls. Seventeen-year-old Bess Heath has led a sheltered existence as the youngest daughter of the director of the Niagara Power Company. After graduation day at her boarding school, she is impatient to return to her picturesque family home near Niagara Falls. But when she arrives, nothing is as she had left it. Her father has lost his job at the power company, her mother is reduced to taking in sewing from the society ladies she once entertained, and Isabel, her vivacious older sister, is a shadow of her former self. She has shut herself in her bedroom, barely eating—and harboring a secret. The night of her return, Bess meets Tom Cole by chance on a trolley platform. She finds herself inexplicably drawn to him—against her family’s strong objections. He is not from their world. Rough-hewn and fearless, he lives off what the river provides and has an uncanny ability to predict the whims of the falls. His daring river rescues render him a local hero and cast him as a threat to the power companies that seek to harness the power of the falls for themselves. As their lives become more fully entwined, Bess is forced to make a painful choice between what she wants and what is best for her family and her future. 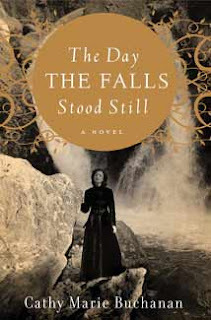 Set against the tumultuous backdrop of Niagara Falls, at a time when daredevils shot the river rapids in barrels and great industrial fortunes were made and lost as quickly as lives disappeared, The Day the Falls Stood Still is an intoxicating debut novel." "In the glittering world of Regency London, where gossip is exchanged– and reputations ruined–with the tilt of a fan, Mélanie Fraser is the perfect wife. Devoted to her husband, Charles, the grandson of a duke, she is acknowledged as society’s most charming hostess. But just as the elegant façade of Regency London hides a dark side, Mélanie is not what she seems. She has a secret: one that could destroy her perfect jewel-box life forever…and the cost to keep it is an exquisite heirloom ring surrounded by legend and power. The search for it will pull Mélanie and Charles into a gritty underworld of gin-soaked brothels, elegant gaming hells, and debtors’ prisons.In this maze of intrigue, deception is second nature and betrayal can come far too easily…"
I also purchased via Alibris and BooksForGoodwillGetJobs (Highly recommend them, great quality and super FAST STANDARD SHIPPING!!) While I'm here let me inform you to NOT use BargainBookStores via Alibris. "Against a violent background, the story of ill-fated Anne Boleyn is told with remarkable insight and is interwoven with that of the other murdered Queen, Catherine Howard. Anne is seen as the humble daughter of a ruthless father, cheated of her lover, so that out of her proud nature grows that ambition which destroyed her, leading her to exchange the powerful role of King's mistress for the dangerous one of King's wife. While she moves forward to tragedy, the little Catherine Howard is seen growing up, amid circumstances which may shock and horrify but which cannot fail to arouse deep interest and pity. And through the book strides the magnificent, dominating figure of Henry VIII - sanctimonious, hypocritical, shrewd, cunning and ruthless, sometimes sentimental but always amorous. 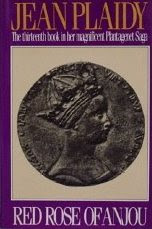 The theme of this long and powerful novel is murder - and not only the murder of one of the most fascinating personalities in English history, Anne Boleyn, but of many more of the vital and famous people who lived in the dangerous days when a carelessly spoken word, or his nearness to the throne, was sufficient to send a man to the block." THE DEVIL’S QUEEN: A Novel of Catherine de Medici (On Sale July 21, 2009) by Jeanne Kalogridis. Another fast shipment via Alibris from Seller Book Culture Inc, got this brand new book for $12.94 + 3.99 shipping. Can you hear my voice tingling with excitement? No? Well it is giddy with glee. 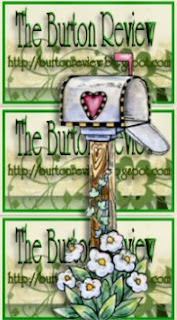 I am so looking forward to this one I am daring to move it up on my to read list. ARGH The AGONY of AWESOME books!! It's a pretty hefty hardcover of 468 pages, so I think I ought to read a quick read/review before I pursue the pleasure of this one. Weep. "Confidante of Nostradamus, scheming mother-in-law to Mary, Queen of Scots, and architect of the bloody St. Bartholomew’s Day Massacre, Catherine de Medici is one of the most maligned monarchs in history. In her latest historical fiction, Jeanne Kalogridis tells Catherine’s story --- that of a tender young girl, destined to be a pawn in Machiavellian games. Born into one of Florence’s most powerful families, Catherine was soon left a fabulously rich heiress by the early deaths of her parents. Violent conflict rent the city state and she found herself imprisoned and threatened by her family’s enemies before finally being released and married off to the handsome Prince Henry of France. Overshadowed by her husband’s mistress, the gorgeous, conniving Diane de Poitiers, and unable to bear children, Catherine resorted to the dark arts of sorcery to win Henry’s love and enhance her fertility --- for which she would pay a price. Against the lavish and decadent backdrop of the French court, and Catherine’s blood-soaked visions of the future, Kalogridis reveals the great love and desire Catherine bore for her husband, Henry, and her stark determination to keep her sons on the throne." "The story of that amazingly influential and still somewhat mysterious woman, Eleanor of Aquitaine, has the dramatic interest of a novel. She was at the very center of the rich culture and clashing politics of the twelfth century. Richest marriage prize of the Middle Ages, she was Queen of France as the wife of Louis VII, and went with him on the exciting and disastrous Second Crusade. Inspiration of troubadours and trouvères, she played a large part in rendering fashionable the Courts of Love and in establishing the whole courtly tradition of medieval times. Divorced from Louis, she married Henry Plantagenet, who became Henry II of England. Her resources and resourcefulness helped Henry win his throne, she was involved in the conflict over Thomas Becket, and, after Henry's death, she handled the affairs of the Angevin empire with a sagacity that brought her the trust and confidence of popes and kings and emperors." "Margaret of Anjou came to England and married King Henry VI. Born to a family of strong women, Margaret was no exception. She was passionate, impulsive, loving, violent, and more enamored of the crown than of her peace-loving husband. Henry was king, but the Earl of Warwick -- known as the Kingmaker -- supported Richard of York. In a fateful scene in the Temple Gardens, as men were called to pluck a rose to show which side they stood, Richard and Henry were on opposing sides. It was a prelude to the War of the Roses. In this turbulent period, amid the fortunes of war, men who loved power took center stage, and Henry, poor ineffectual Henry, wished only to be left alone with his books and his music. Yet his wife Margaret schemed for his power, and later for his son's -- and rushed headlong into disaster." "A classic tale of British middle-class love, this novel displays Forster's skill in contrasting British sensibilities with those of foreign cultures, as he portrays the love of a British woman for an expatriate living in Italy. One of Forster's earliest and most celebrated works." "Delilah" by India Edghill which comes out this fall. "Staking a homestead claim in the untamed Canadian frontier of the 1880s was a hard proposition. When the manager of a large cattle company, Portis Martin, runs roughshod over the settlers, Hank James takes a stand. Martin had been using every trick he knew against the homesteaders, but then James and his partner arrive to take him on. Fighting against the land-grabbing cattle company, James decides he wants it all, including the woman he loves. He finds Sharon calling herself Miss Sadie and running a bordello. The true grit of Western settlers is tested in this historic saga."